The Market data section sets options related to market data and database management. 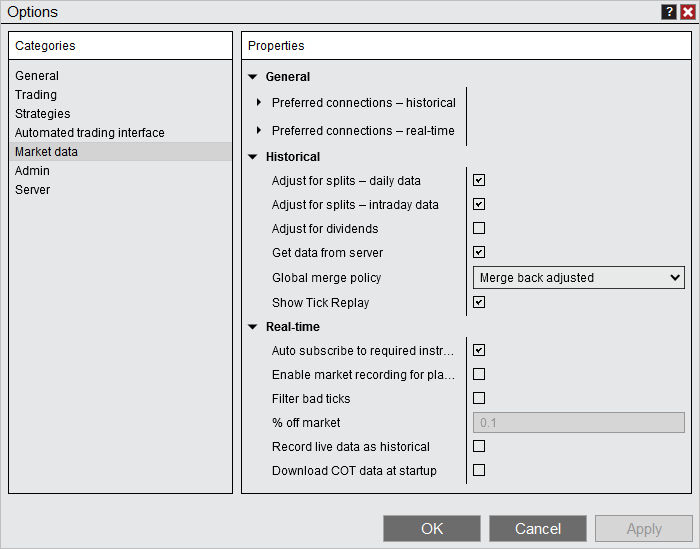 Sets a connection to be used by NinjaTrader for historical data if it is connected. You can choose a separate preferred connection for each instrument type, expand the triangle to the left of the property name to set a preferred connection. Sets a connection to be used by NinjaTrader for real-time data if it is connected. You can choose a separate preferred connection for each instrument type, expand the triangle to the left of the property name to set a preferred connection. Enables or disables split adjusting historical data for daily data. Some providers already split adjust their daily data and you do not need to adjust it a second time if your provider handles it on their side. Please see this help guide page under the section "Understanding splits and dividends" for more information. Enables or disables split adjusting historical data for intraday data. Some providers already split adjust their intraday data and you do not need to adjust it a second time if your provider handles it on their side. Please see this help guide page under the section "Understanding splits and dividends" for more information. Enables or disables the retrieving of historical data from the data provider's server. When disabled, only local data stored on your PC will be used. For more information on merge policies, see the "Understanding merge policies" section on this page. When enabled, allows "Tick Replay" to be configured from a data series menu. Please see Tick Replay for more information. Enables or disable filtering of bad ticks. This filtering only works on real-time data and will filter ticks that are a greater then a set percentage away from the last tick. Set the percentage for filtering with the property: "% off market". Note: If NinjaTrader receives 2 or more ticks that violate the tick filter we will no longer filter the ticks as the market is assumed to have legitimately gapped up or down. Enables or disables the storage of incoming real-time Chart data to your local PC for future historical data requests. If you are connected to a provider that supports historical data, disable this feature.